Thinning Hair? It's Not a Problem Anymore! So you're brushing your hair, and you suddenly realize that a huge chunk of hair has come from your scalp. You think you've done everything right and you don't understand why your hair is getting so thin and that you're balding. There must be something you're doing wrong?! Keep in mind, that it is normal for you to lose some hair during the day, as the average person loses between 50-100 strands of hair a day. Today I'm here to give you some tips on how you can make your hair appear fuller and actually help to potentially slow down your balding process. There are many different reasons why you could potentially be losing your hair so we will look at a bunch of those reasons today. First, you wanna look into the inside, because if you are not healthy on the inside there's no way that you can be healthy on the outside with thick, luscious locks. There a couple things that you should make sure that you are consuming enough of so that your hair is healthier. 1. Eat More Protein: If you didn't know, your hair is made up of a protein called Keratin, and instead of just loading your hair up with protein on the outside you need to make sure that you are consuming enough on the inside. If you have a diet where you don't consume protein, make sure that you change that up to ensure that you are getting enough protein. Each day an individual should consume about 45 grams of protein. Usually, one serving of meat or fish can fulfill about half of the quota, but if you can't eat meat you can find protein in foods like nuts, tofu, legumes, and grains like quinoa. 2. Vitamins: If you have deficiencies of certain vitamins that can cause your hair to slow down its growth and actually has been shown to cause thinning hair. A deficiency of Vitamin B12 and Vitamin D can cause this. This type of deficiency can easily be solved by increasing your intake of foods like meat, dairy, and fish. Taking a quality B Complex can help to stabilize your levels as well as taking Vitamin D supplements. 3. Pump Some Iron: Although working out can help with thinning hair that's not what we're talking about here. Low iron is one of the most common causes of hair thinning and if this is your case you have to make sure that you are rebooting your hair from the inside out by consumer more iron-rich foods, some include spinach, broccoli, legumes, and tofu. Make sure that you are also consuming enough Vitamin C, as it helps to promote Iron absorption. 4. Be Kind To Your Body: People who eat a lot of fast food, don't exercise, drink, smoke, and party excessively usually don't have very good hair. Avoiding these things and consuming a healthy diet and drinking plenty of water you can have better hair. Hair has and always will be a sign of your overall health. If your hair is unhealthy you must be doing something damaging to your body. Exercising can help reduce stress and can help to get extra blood flow to your scalp. After that workout make sure you get plenty of sleep. Sleep is your body's time to repair itself and is very important for healthy hair. Secondly, let's look at some hair care. This is the most known problems that will lead to a person having thinning hair or hair that breaks easily. Some of these things we have said many times before, but it is always best to reiterate healthy hair tips. 1. Never Skip Conditioner: Over time, if you do not use conditioner your hair can become very brittle and will break very easily. Dry hair loses its elasticity and strength and usually is prone to damage. Using a lightweight conditioner can help to strengthen and moisturize your hair without weighing it down. Conditioners that contain panthenol and glycerin are best to moisturize hair and keep your fragile hair strong. Make sure you are not shampooing every day either, some shampoos damage your hair by breaking down its natural structure if used too much. 2. Gentle Care Is Key: When working with your hair make sure that you are being gentle, if you are too rough you can damage your hair and weaken it over time. Firstly, avoid tight ponytails and hairstyles that can actually sever your beautiful strands in half. When drying, make sure you pat dry and don't rub vigorously. Avoid excessive brushing and tight curlers as they can threaten the health of your hair. 3. Cool Down: We've said this in almost every post, heat is not your hairs friend and that includes hot styling tools. Lower the heat on your styling tools and make sure to use a good heat protectant. Any product with silicones in it can wrap your hair follicles and protect them from the heat. Heat stress on your hair can weaken the proteins in your hair causing it to break and fall out. 4. Hats Off: Although people may think that this is a great way to hide the fact that your hair is thinning, wearing hats can do more harm than good. The material of the inside of a hat causes way too much friction with your hair and can cause your hair to shed and break more easily. 5. Water Based: Make sure that the styling products you use are water-based. Waxes and oils can sometimes deteriorate hairs and lead to further damage suffocating your hair. Not to mention, to put these types of products in your hair you can actually break your hair with the rough manipulation and styling. Another thing that you can do to make your hair appear thicker is to follow certain styling tips/tricks/hacks that will make your hair appear much thicker than it actually is. 1. Snip-Snip: Cutting your har actually helps to create more volume in your hair making it appear much thicker and voluminous than it was before. Longer hair usually gets weighed down losing fullness and volume at the root of your hair. 2. Darker Is Better: A darker root gives the appearance of a denser scalp. When getting your hair colored, ask your colorist to dye the roots of your hair a slightly darker color than the rest of your hair. This will give the illusion of depth and can help to camouflage the appearance of thinner hair. It has been compared to the same way that darkening eyebrows can make them appear thicker. 3. Your Part Is Key: When styling your hair, avoid center parts and sleek hair as this makes your hair appear much thinner. Styling your hair in a deep side part helps to give your hair the appearance of volume and fullness around your face. By adding some movement to your style with a curling iron or wand, you may be able to give your hair some extra body and fullness. 4. Try A Hair Thickener: A hair thickener is a product that, when activated by heat this product can plump up each individual hair follicle to give it needed thickness and give the appearance of fuller, denser hair. At Rejuvenol we have a revolutionary hair thickener that will give you the best results for thicker looking hair. Rejuvenol's heat activation complex penetrates, expanding each individual hair shaft from within as it adds body, shine and thickness to the hair. 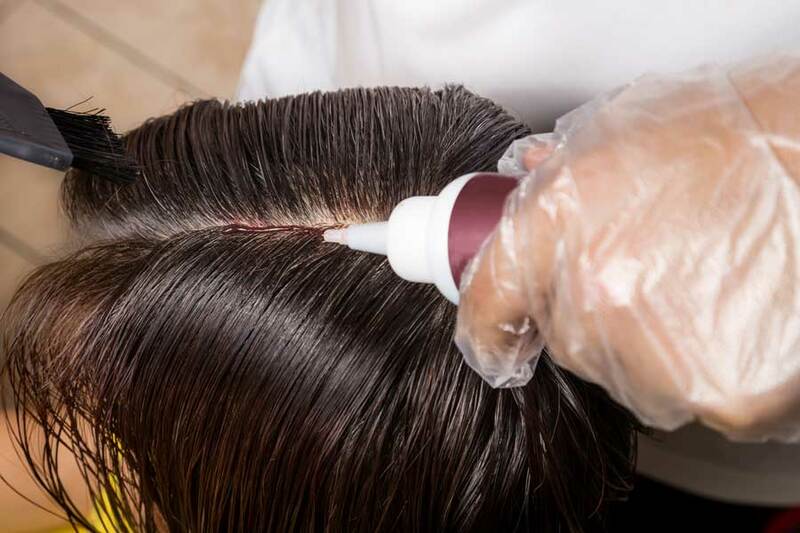 The thickener can be heat activated by a blow dryer, heat lamp, hot rollers, or a hairdryer. 5. Try The Rejuvenol Complex Line For Thinning Hair: You may not know this, but at Rejuvenol we have a line of four products that have been specially formulated for thinning hair. There are a Volumizing Shampoo and Conditioner, Scalp Treatment, and Spot Treatment Serum Drops. Rejuvenol Complex Anti-Aging Anti-Thinning Hair System is a synergistic regimen of products for fine and thinning hair that combines gentle cleansing with the scalp treatment and therapy products in advanced formulations that improve the scalp's environment and sustains younger-looking, thicker-looking hair. Our vitamin-enriched formulations strengthen hair and the follicle to reduce breakage and combat excess hair loss. The shampoo gently cleanses the hair and scalp and frees the follicle while the treatments provide a truly synergistic effect by stimulating microcirculation by bringing oxygen and nutrients to the scalp. Increased oxygenation has been proven to stimulate cellular activity while the increased blood flow carries away toxins and reduces inflammation. Using a unique liposome-based delivery system to deliver the natural, herbal, and plant-derived Rejuvenol Complex, Rejuvenol Complex Anti-Aging Anti-Thinning Hair System works to neutralize and remove toxins and excess androgens such as DHT from the scalp, while delivering vitamins and micro-nutrients to the follicles. For both men and women as a preventative measure against the possibility of excessive hair loss while amplifying hair texture. If all else fails, or you don't know the cause of your thinning hair/hair loss, go to a specialist. A hair specialist is called a Trichologist, they specialize in your hair and scalp and can help to determine the cause of hair breakage, thinning, and loss.